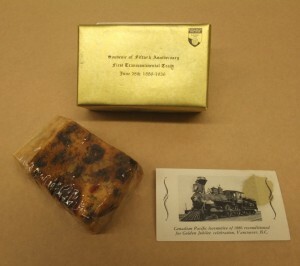 Figure 1: Canadian Pacific Railway commemorative fruitcake, 1936. Courtesy of the Bruce Peel Special Collections Library, University of Alberta. Last week a colleague showed me something that I found extraordinary: a round medallion, about the size of a milk cap, hanging from a long necklace chain. Set under the medallion’s plastic cover was a fragile square of loose-weave cotton, once white but now more of a cream colour, printed with a bright blue and yellow flower. To my surprise, it was a piece of a flour sack. “During the Depression,” he explained, “women would choose which flour to buy based on which brand had the prettiest sack. Then they would reuse the material for dishtowels, curtains, dresses, or whatever else they needed.” My colleague’s friend collects these vintage items and uses bits of the fabric to make jewellery. I had heard about this resourceful apparel, of course. I knew an elderly woman who once sewed her family’s underwear from such material, and I even inherited a flour sack dress from the 1960s, when they made a kind of hippie-chic comeback. But I’ve been thinking a lot lately not about fashion history but food history, and how what we eat intersects with other aspects of our societies and our lives. This necklace was a material reminder that food is not just about biological sustenance. It is about the environmental, political, economic, ethical, social, religious, and other processes that push and pull a substance from field to table, as well as the flour sack dresses it makes along the way. In consuming food, we consume culture—and often vice-versa, too. This is the overarching theme of two complementary exhibits set to launch on 24 October 2013 at the University of Alberta’s Bruce Peel Special Collections Library. 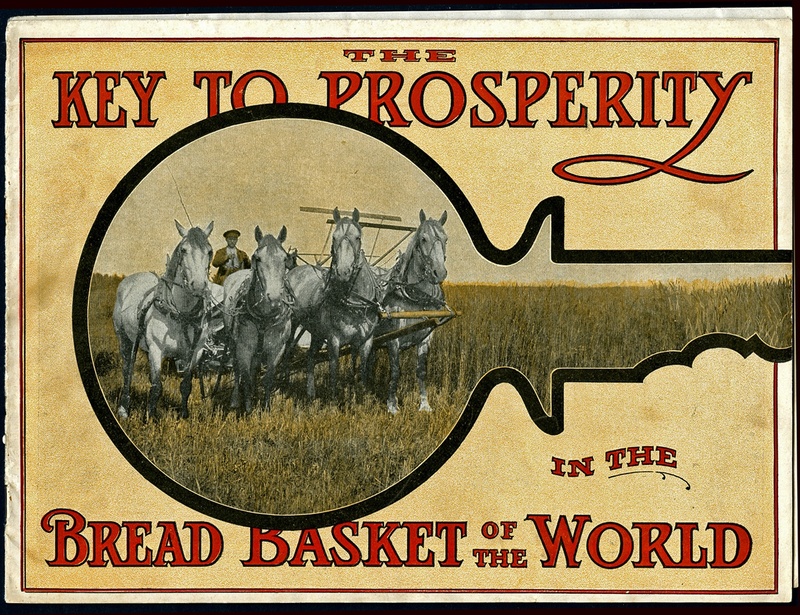 Figure 2: Canadian Northern Railway Company, The Key to Prosperity in the Bread Basket of the World, c. 1911. Courtesy of the Bruce Peel Special Collections Library, University of Alberta. The first is an online exhibit, Culinaria: A Taste of Food History on the Prairies, which I curated with Kristine Kowalchuk. The exhibit’s many books and brochures, along with five short essays, take a broad look at western Canadian food history, recognizing that a prairie foodscape, like a prairie landscape, can be vast indeed. Items as diverse as church cookbooks, an anti-oleomargarine brochure, a 1918 guide to the Alberta rural school lunch program, and a growth chart from a baby food producer offer a taste of food’s many uses and meanings in prairie life, from the assertion of ethnicity to the power of corporate influence. My favourite object is an original slice of commemorative fruitcake from 1936, baked and boxed to celebrate the fiftieth anniversary of the Canadian Pacific Railway’s first transcontinental voyage (Figure 1). This rather stale memento ties food directly to the late nineteenth- and early twentieth-century project of “opening” the west, a project that was itself driven by the area’s vast farming potential. 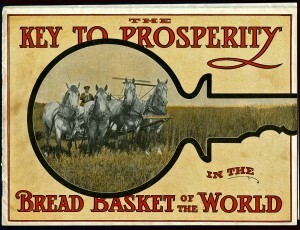 The prairies were to be the breadbasket of the nation (Figure 2). The second exhibit, Collecting Culinaria, which I curated in partnership with the University of Alberta’s Merrill Distad, draws largely from his late wife’s extensive culinaria collection. A passionate bibliophile and talented cook, Linda Miron Distad collected thousands of books from countries around the world representing several hundred years of food history. Our diverse display looks at the evolution of British, French, and North American cookbooks and household guides since the eighteenth century and highlights some of the most salient and provocative themes to emerge out of such a vast collection. These include the influence of celebrity chefs and famous restaurants, the reign of Victorian household icon Mrs. Beeton, and the many uses and meanings woven into manuscript recipe collections. Food has its own history, of course, but it seldom operates in isolation. We might consider, for example, the value of collective endeavours like The Home Cook Book, a Toronto ladies’ fundraising project from 1881 that has been identified as Canada’s first community cookbook, in affirming women’s ability to organize, share, and ultimately validate their work. 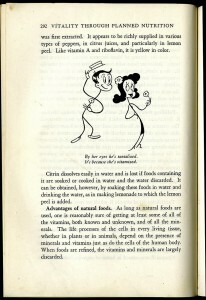 Figure 3: Adelle Davis, Vitality Through Planned Nutrition (New York: Macmillan, 1942). Courtesy of the Adelle Davis Foundation. What we eat and how we eat it can be the manifestation of powerful philosophical and political continuities and changes, reflecting ideals of dietetics and health, religion and spirituality, agriculture and economics, citizenship and culture. In my case, flour sack dresses and vintage cloth necklaces are also reminders that we wear our food both literally and figuratively. Food becomes our bodies, whether we trust in the Galenic humoral system or present-day models of nutrition. 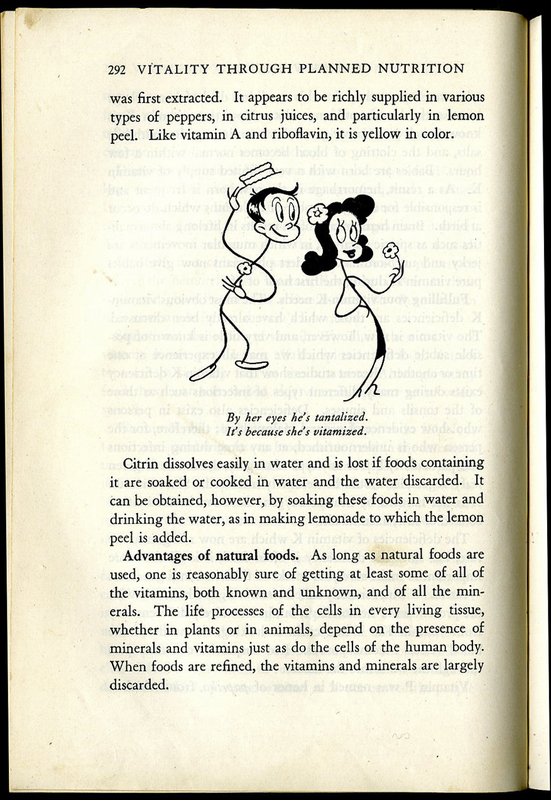 As a cartoon from mid-twentieth-century home economics guru Adelle Davis teases, “By her eyes he’s tantalized / It’s because she’s vitamized!” (Figure 3) We truly consume our understandings of science, beauty, fashion, and economics, leading to bright vitamin A-powered eyes or a charmingly flowered (floured?) outfit. I wonder if the bread from that stylish sack tasted like the triumph of economy or the humility of poverty? As the everyday expression of grander events like the Great Depression, prairie immigration, women’s political and social action, or the discovery of vitamins, food history finds its deepest resonance in quiet, private experiences. We carry it in our hearts, on our bodies, and around our necks. Caroline Lieffers completed her MA in History at the University of Alberta in 2010, focusing on cookery and household management in nineteenth-century Britain.